Since inception in 2007, Connecting Country has supported significant on-ground conservation works, coordinated community education and awareness raising activities, provided assistance to the local Landcare movement, and implemented a rigorous monitoring and evaluation program. 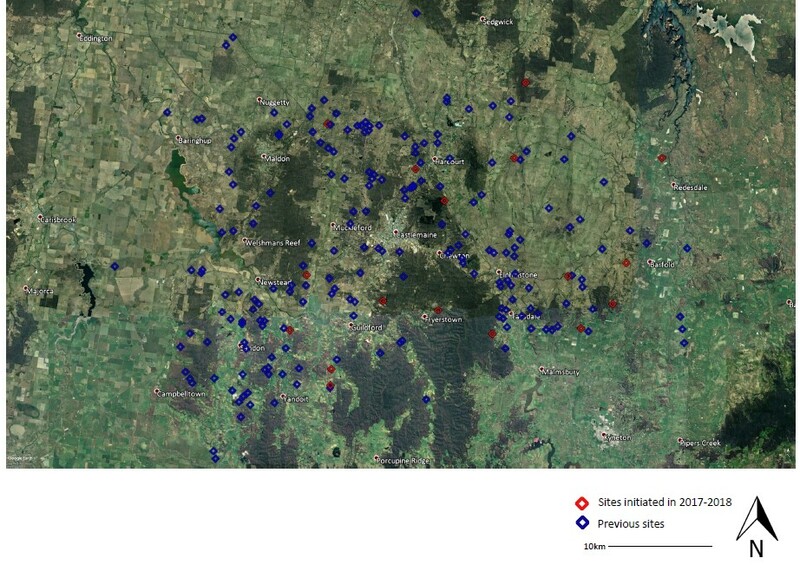 Since 2010 Connecting Country has installed over 450 phascogale nestboxes on private and public land across the Mount Alexander region, in collaboration with academic experts, landholders and volunteers. Nestboxes are located systematically across the landscape to allow scientific analysis of results to better understand phascogale distribution and habitat preferences. Connecting Country staff and volunteers have conducted several rounds of nestbox monitoring, when funding allowed. Connecting Country also works with volunteers to monitor 50 bird survey sites located in various habitats across the region, collecting ongoing data from 2010 to 2018. This provides invaluable information about the current status of woodland birds, and whether our revegetation efforts are successful in establishing wildlife habitat. Our regular educational events attract over 1,000 participants annually, engaging our community to appreciate and protect our local plants and animals. Our achievements are highlighted in the table below and links to our annual reports follow.